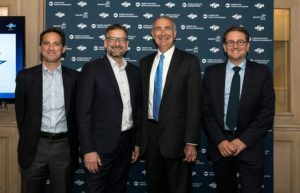 Leading global satellite operators Intelsat, SES, Eutelsat and Telesat have created a consortium called the C-Band Alliance, or CBA, which they believe could open up new spectrum for 5G services. The CBA was developed in response to a proceeding initiated by the US Federal Communications Commission in August 2017. It will establish a commercial and technical framework that enables terrestrial mobile operators to quickly access spectrum in a portion of the 3,700 to 4,200 MHz frequency band in the US, a move that they say will speed up the deployment of next-generation 5G services. The CBA will be led, effective immediately, by Bill Tolpegin, who is currently CEO of OTA Broadcasting. One of his key tasks will be to ensure that pre-existing customer services are protected from potential interference as any new wireless services are introduced into the cleared portion of the spectrum.